Wow. This week’s exercise of posting the trouble spots in my house (ok, posting a small fraction of the trouble spots) and then posting “after” shots has been really encouraging. I’ve had a few insights I hope to hold onto, and I’ve made some real progress. I feel really good about my work on yesterday’s spot, but first let me share a couple things I’ve learned. I need to pick small spots to redo one at a time. My whole house is pretty disorganized and cluttered, and frequently I try to get everything perfect all at once. Well, not frequently, clearly, or I’d be blogging right now on deep theological issues or world peace instead of a messy counter top. But my all-or-nothing approach is exhausting and unsustainable. Even with the self-imposed pressure to post each day this week, I’ve been able to make great progress on a defined space. I’m not just a messy housekeeper. I am that, but there are other systemic issues at play. Our house is short on storage, and I need better space and better systems for my stuff – bills, kid papers, writing/blogging/speaking/comedy stuff. Those are both issues I can address, and there’s definitely an IKEA trip in my near future. I have three little boys and a husband whose eyes truly do not register either messy or cluttered. He. Does. Not. Care. A degree of chaos will always be present in our home. Since we’ve already established that I’m not a great housekeeper and I’d much rather read magazines than dust them, this ain’t never going to look like any of the houses IN those magazines. Life is too short for my house to be perfectly clean. ON THE OTHER HAND, Mama deserves a little pretty, too. So I need to find the balance between chaos and perfection that allows me a few peacefully clean surfaces, a few beautiful sparkly things and a cozy spot to read those magazines, cause I’m worth it, baby! And speaking of magazines……. So, there’s good news, and there’s bad news…..
Oh, and those weird Sunday school sculptures? Let us never speak of them again…. Now it’s your turn, I’d definitely love input and advice from you, wise readers. What are your best tips for staying on top of clutter, or staying on top of messy, or staying on top of your magazine reading? Did you miss the earlier posts? They are here, here, and here. Posted in grace, Uncategorized and tagged home, lifestyle, organizing. Bookmark the permalink. I had to cut many of my subscriptions. 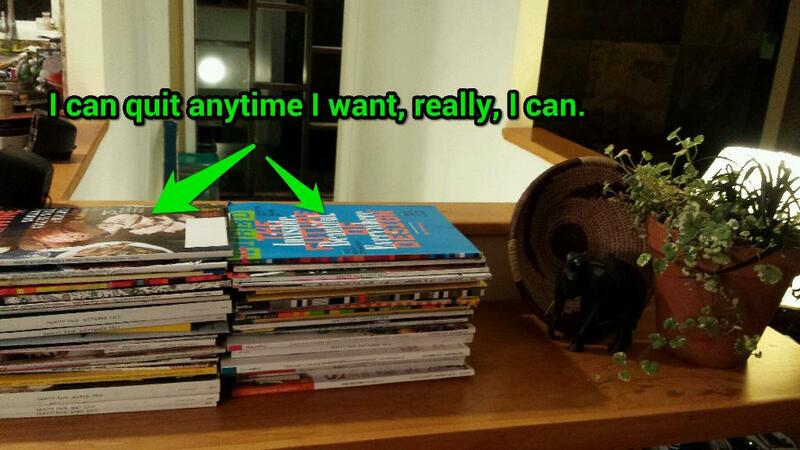 I just don’t have time to read them like I used to, and it seems such a waste to recycle an unread magazine. So our kitchen table always has copies of Smithsonian, National Geographic, The New Yorker, and The Week. The boys will read them while they eat breakfast, and if they are on the table, I’m more likely to read them too. When I bring the mail into the house, I try to go through it RIGHT THAT MOMENT. Ads and dumb catalogs go straight into the recycling bin without a glance. Bills are taken from their envelopes and put in the drawer where my bills live until I pay them, their envelopes and inserts go straight into recycling. Mail for Justin goes in his pile on the corner of the counter (lots of mail for doctors–there are some things he never sees. I recycle lots) and he is pretty good about weeding through it each night. Good luck with it all! I agree that slow and steady wins the race. Your kitchen table magazines sound like mine, with a little more tech thrown in – Wired is my eldest’s favorite. Love Smithsonian, National Geographic, and I’m a big fan of Biblical Archaeology (thanks to dad passing it on). Can’t remember the professor’s name, but a couple of my favorite college classes were ancient Rome and Greece, and ancient northern Africa. 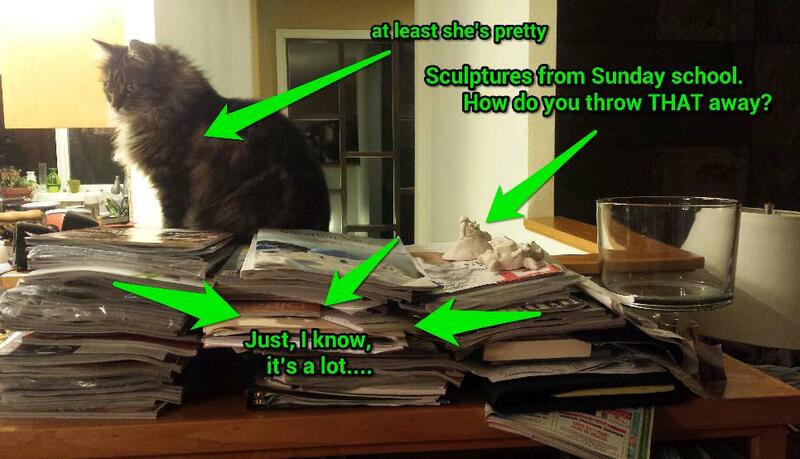 I do pretty well sorting recycling directly into the bin from the mailbox, but its what happens next that’s UGLY. That’s my next goal, I think – get a system! I used to have the same issues. Add homeschooling, gardening, sewing, knitting, crocheting, embroidery, houseplants, reading, cooking and baking into the mix and that’s a lot of stuff. My now successful method involves dividing the house into sections, and using a timer. It’s worked for 30 years and not at all overwhelming. Good luck! I have definitely used a timer before, and I LOVE it. Helps me keep motivated, take breaks, and I usually discover the chore didn’t take as long as I thought it would. Thanks for stopping by! Taking breaks is key! My house is on the roomy side, and I do it all myself now since kids are grown up and away. But I use the same method. After each 20 minutes, I have a cup of tea, or fold laundry, or play piano exercises. Amazing how easy it is now. At first when I started doing it, it had to quell my irritation that I wasn’t getting everything done at once, but now – it’s always done! Tara I always feel better after a good de-cluttering and it brings new energy into the space and I feel ready to create. Every three months I have a mini de-clutter. My enemy is dust I hate dusting and cleaning fridges…..love the clean up job…. Donate your magazines to a library, seniors home, autoshop, preschool. Have you forgotten cutting letters of the alphabet pictures out? By kid #4, cutting magazines became kid #1, #2, and #3’s job before recycling…And who wants to read Car&Driver waiting on a repair? Do us ALL a favor. Dusting…first, change your air filters. You’ll reduce the amount of dusting and gross yourself out by what’s “up there”. Determine what your real currency is…time? Money? New experiences? Dinner out? Price out what you do in terms of your currency. Would you trade a house cleaning for childcare, a home organizer for yard work or pet sitting? You’ve got some leverage…four able bodied trained scouts can be bartered for your peace (piece) of mind Tara. I constantly barter with my kids, my friends, and their kids and friends to get what I want. Their currency is different than mine so everyone is happy. I definitely pass the magazines around already, but I like your ideas about the trading experiences! Thanks! I love the honesty of this post, that’s beautiful. My favorite line was there will always be a bit of chaos in the house. Love that, it’s the same way at my house too! Right? A little chaos keeps us from being too uptight, at least that’s what I say! Thanks for the comment!